The Group is organising an ongoing programme of conferences for the coming years. Researchers who consider that they might be able to deliver a paper on a subject relevant to any of the coming conferences are invited to write to the Docklands History Group with a brief synopsis of the proposed paper. Papers should be written so that they can be given in half an hour. It is intended that proceedings of the conferences will be published and contributors should confirm that thy will be able to deliver their final papers to the editorial team within six months of the conferences. The programme for this conference is now complete, The subjects covered will include the medieval waterfront, ships of the period, medieval merchants and patterns of trade, how the river was managed and settlements outside the City of London. 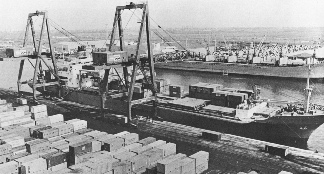 This conference will look at the huge changes to the port of London that took place in the post-war years with the introduction of modern transport systems that led to closing nearly all of the enclosed docks and the loss of most of the riverside wharves and transformed the operation of the port. The Group would be interested in hearing from those who might be able to contribute a short talk (30 mins) on a relevant subject.